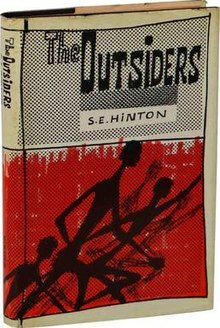 Published in 1967 by 17 year-old Hinton, The Outsiders was a suprising and groundbreaking piece of young adult literature. Hinton paints a picture of real teenage life, complete with dysfunctional families, gang rivalries, and suicide. It is as timely today as it was then. The story follows about a year in the life of young Ponyboy Curtis, one of a large group of outsiders called "Greasers" in an Oklahoma city. Ponyboy lives with his brothers Darrel (Darry) and Sodapop. The Curtis parents were killed in a car accident and Darrel takes care of the family. When the novel opens, Ponyboy is walking home from a movie. He gets stopped by a group of "Socs", the rich kids in town who have a distinct hate for greasers. Ponyboy's brothers, and some of his friends, step in and save him from a bad beating. Darry yells at Ponyboy for going to the movies alone. The readers quickly become aware of the dangerous nature of the lives these boys live, and of the strained relationship between Ponyboy and Darry. The next night, Ponyboy, his best friend Johnny Cade, and their friend Dallas Winston (Dally) sneak into the drive-in movie. Johnny is a quiet and nervous, and Dally is tempermental. He begins to tease and bother two Soc girls at the movie, Cherry Valance and Marcia. After Cherry throws a soda at him, Dally looks like he is about to get mean and violent, but Johnny intervenes. Dally stalks off. Cherry thanks Johnny, and then gets into conversation with Ponyboy. Two-Bit, another friend, shows up and scares Johnny when he does. As they go for popcorn, Cherry asks why Johnny is so nervous. Ponyboy explains that Johnny had been almost fatally beaten by a group of Socs. Cherry tries to tell Ponyboy that "things are rough all over", but Ponyboy thinks that the Socs have it better. Cherry, Marcia, Ponyboy, Johnny and Two-Bit start to head home together. Cherry and Marcia's boyfriends pull up and it becomes clear that the girls had left the boys earlier in the night because of an argument. In order to avoid a fight between the groups of boys, the girls agree to go with their Soc boyfriends. Two-Bit heads home, and Ponyboy and Johnny go to the park, where Ponyboy talks about how he wish they all lived in the country. The two accidentally fall asleep, which causes Ponyboy to get home a few hours late. Ponyboy and Darry fight and it ends in Darry slapping Pony across the face. Ponyboy runs out and meets up again with Johnny. He cries and complains that Darry and he used to get along fine, but now all they do is fight. He suggests they walk around to cool off before he tries to go home. It isn't long before they are discovered by the now drunk boyfriends of Cherry and Marcia, Socs Randy and Bob, and a few of their friends. The Socs surround Ponyboy and Johnny, and insults get thrown both ways, and the the Socs jump the boys. As they holding Ponyboy's head in the water of the park fountain, Johnny pulls out his switchblade and stabs Bob. The other Socs run, but Bob has been fatally wounded. The two boys run to Dally, who gives them money and a gun and tells them about an old church in the country where they can hide out. Stowing away on a train, they get to the church. After cutting their hair, and dying Ponyboy's blond, they spend their time smoking, eating bologna sandwiches, and reading Gone with the Wind. Johnny thinks that the characters of the book are like Dally, gallant and all. One morning, a sunrise reminds Ponyboy of the Robert Frost poem "Nothing Gold Can Stay", which he recites, but he can't quite tell Johnny what it means. Dally shows up after about a week. He gives a letter to Ponyboy from Sodapop, which talks about how sorry Darry is for the fight, and wishes Ponyboy could come home. The boys go for lunch, and Johnny says he wants to go back and turn himself in. Dally, who has been to jail, tries to talk Johnny out of it and gets angry when it becomes clear that Johnny is determined. When they get back to the church, it is on fire, and a group of school children are trapped in it. Realizing they must have caused the fire from their smoking, Johnny and Ponyboy rush inside. After getting the kids out, Johnny pushes Ponyboy out a window, but Dally has to go in to pully Johnny out. Johnny ends up in critical condition. The teacher who was with the children thinks they are all heroes, and Ponyboy is amused and tells him that they are criminals. At the hospital, Ponyboy is reunited with Darry and Sodapop. Seeing Darry cry makes Ponyboy realize how much he is loved, and the anger is long forgotten. However, the fight in the park and the publicity have caused family services to get invovled, and the Curtis boys realize that they might be separated. Ponyboy also finds out that a rumble has been planned between the Socs and all the Greasers, including other small gangs. Two-Bit and Ponyboy visit Johnny at the hospital at the next day, where Johnny asks for a copy of Gone with the Wind and then passes out because he is so upset at the idea that his mother wants to visit. Ponyboy realizes that Johnny is dying. They visit Dally in his room as well, and after realizing how bad Johnny is, Dally asks for Two-Bit's switchblade, and insists that he'll be at the rumble. On the way home, the two run into Randy, who wants to talk to Ponyboy. Randy says how sorry he is about how everything happened, and tells Ponyboy that he couldn't have saved those kids. Ponyboy says maybe he would have, and they leave on amicable terms. They also see Cherry Valance, who lets them know that the Socs have agreed to no weapons at the rumble. She upsets Ponyboy because, although she doesn't blame Johnny for Bob's death, she won't Johnny in the hospital. She insists that Bob had a sweet side. Ponyboy reminds her before leaving that they both look at the same sunset. Ponyboy is clearly getting sick, but he hides this fact from Darry because he wants to fight. The gang goes off to the rumble in high spirits, and Darry starts the fighting by going toe-to-toe against an old friend from high school. The fight is evenly matched for a while, but it isn't long before the greasers have the socs on the run. Ponyboy gets hammered a few times, but Dally joins the fight and helps to save him. Afterwards, he drags Ponyboy off to head to the hospital to see Johnny, who is slipping away. At the hospital, Johnny says that he is glad that he saved the kids, and says that he thinks that they had more to live for. Before dying, Johnny tells Ponyboy to "stay gold", like the poem. Dally sinks into angry grief at Johnny's death and takes off. Ponyboy manages to get a ride home, where everyone is treating their wounds from the fight. Ponyboy, in a high fever, is confused, wondering where the big celebration is. He tries to tell the group about Johnny's death, but is interrupted by a phone call from Dally. Dally has robbed a store and needs help. The gang go to meet him in a vacant lot, where they see Dally surrounded by police. Dally commits suicide by cop; he pulls out the gun that isn't loaded and allows himself to get shot. Ponyboy faints from the fever and is hospitalized for a week. While back at home and recovering, Randy visits Pony. Randy is trying to tell Pony that none of it was his fault, but Ponyboy has gone into denial. He is denying Johnny's death and insisting that he himself killed Bob. Randy leaves, confused. Ponyboy struggles with the truth for a long time. The Curtis boys go to court and are allowed to stay together. Ponyboy starts acting out at school, wanting to start fights. Arguments between he and Darry start up again as well. During one of these arguments, Sodapop yells at both of them and runs out of the house. Ponyboy learns that Sodapop's girlfriend Sandy had been cheating on him, and that she has left him for good and won't respond to his letters. He is ashamed to learn that Sodapop has been going through all this alone. Darry and Ponyboy catch up to Sodapop and promise to try to get along better. Later, Ponyboy - who has been trying to complete a writing assignment for English, a class he had been failing - is sitting in his room thinking when he sees the Gone with the Wind book that he had given Johnny at the hospital. A letter from Johnny is in the book. The letter agains says that it was worth it to save the kids, and it tells Ponyboy that he can be anything he wants, despite being a greaser. The letter explains to Ponyboy that "staying gold" means keeping up his interest in sunsets and his ability to be nice to different people, like Cherry Valance. Ponyboy puts the letter down and starts on his English composition, which will be a story all about his life and his friends. This page was last modified on 18 January 2018, at 17:02.